Look forward to encounters with wild animals and grape picking with a buffet lunch in between on this family-friendly day trip departing from Tokyo. Oh, and all this against the stunning backdrop of the iconic Mt. Fuji! Create long-lasting memories on this fantastic day out. Visit Fuji Safari Park and get up close and personal to a wide variety of animals firstly by driving through the Safari Zone on the sightseeing bus and then wandering through the Fureai Zone, where there is a chance to wander among the animals and touch some of them. You can also use some of the free time in the park to buy some souvenirs from the shop. There will be plenty of eating on this tour too with all-you-can-pick-and-eat grapes and a buffet lunch featuring roast beef at a restaurant with stunning views of Mt. Fuji. With bellies satisfied, the tour heads back to central Tokyo. 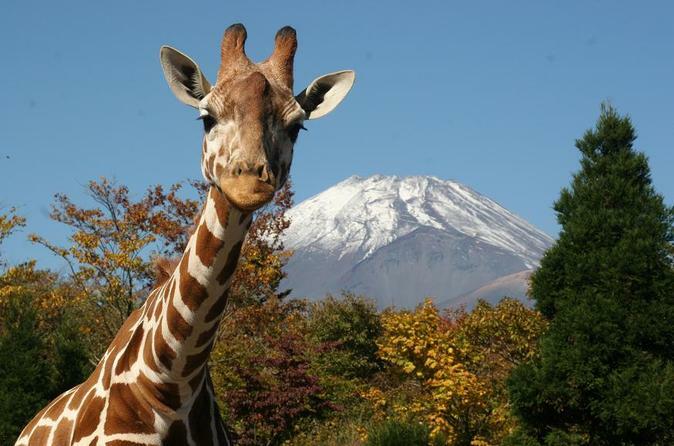 The tour meets at Shinjuku Washington Hotel at 7:30 before departing on the 2 hour bus journey to Fuji Safari Park. Upon arrival, stay in your seats as the bus enters the Safari Zone section where you will be greeted by some of the 900 animals across 70 species that live in the park including bears, tigers, lions, elephants and cheetahs. Feel as though you are wandering through a little piece of the African Savannah set in the magnificent surroundings at the foot of Mt. Fuji. After 50 minutes in the Safari Zone, get off the bus and stretch your legs in the Fureai Zone, which is split into a petting area and a walk-through village. Meet different creatures here like leopards, hippos and hyenas while you can pet meerkats, kangaroos, rabbits and guinea pigs. If you have time before lunch, why not pop into the park shop for some souvenir hunting. With stomachs grumbling by now, the tour heads to Mori-no-Eki station for lunch which is a buffet-style where roast beef is the star of the show. With lovely views of Mt. Fuji from the restaurant, the meal can only taste more delicious! There will also be time given for a spot of shopping here for around 20 minutes. Time to refresh your palates after lunch with some deliciously sweet and juicy grapes. Misaka Farm Grape House is the setting where you can pick and eat as many grapes as you can in 30 mins. Make sure you left some room in your bellies for this acitivity! The tour concludes at this point and heads back to Shinjuku with the scheduled arrival at 17:00 near the Shinjuku Washington Hotel and Shinjuku station West Exit.